Slightly earlier than planned – here are pages 3 and 4! Of course, now that we have digital presses and (almost) everything is computerised, things have changed slightly. It’s funny to have a Puffin Post without the presence of Jill McDonald on every page – but important none the less. 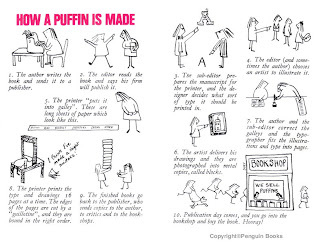 For those who are interested, the first Puffin Post was only 10.5cm x 7cm – the same size as the old membership books! oh what joy…I was Founder Memeber 11306 and as an only child whose greatest happiness lay in books, the Puffin Club was just bliss. I was so sad that it had disappeared when my own children caught the book bug – and am now pondering whether I know anyone of the right age to enroll in the new incarnation. Meanwhile, it’s lovely to have a chance to revisit. Thanks for your comments Kathryn, I’m finding that the club has been a real friend to many children in the past – and we all thought it was just us! What an amazing and diverse family we have become!